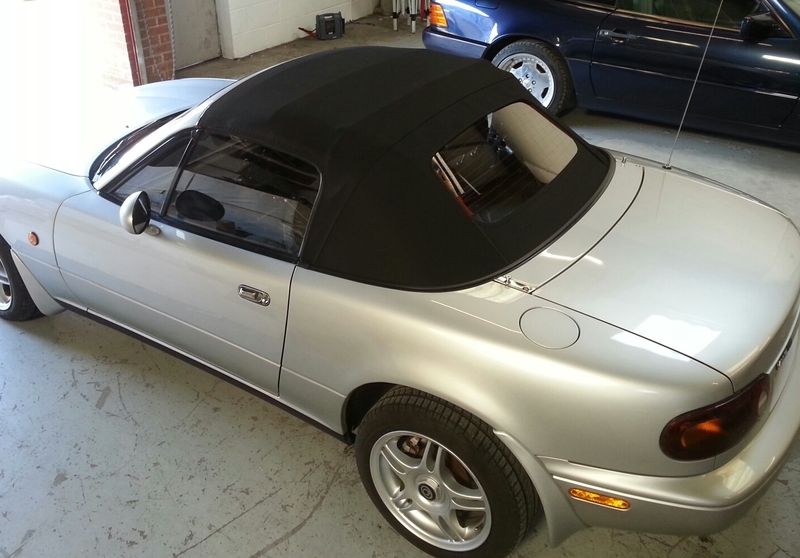 We fit hundreds of MX-5 hoods every year so you can be confident the hoods we fit are the very best available. 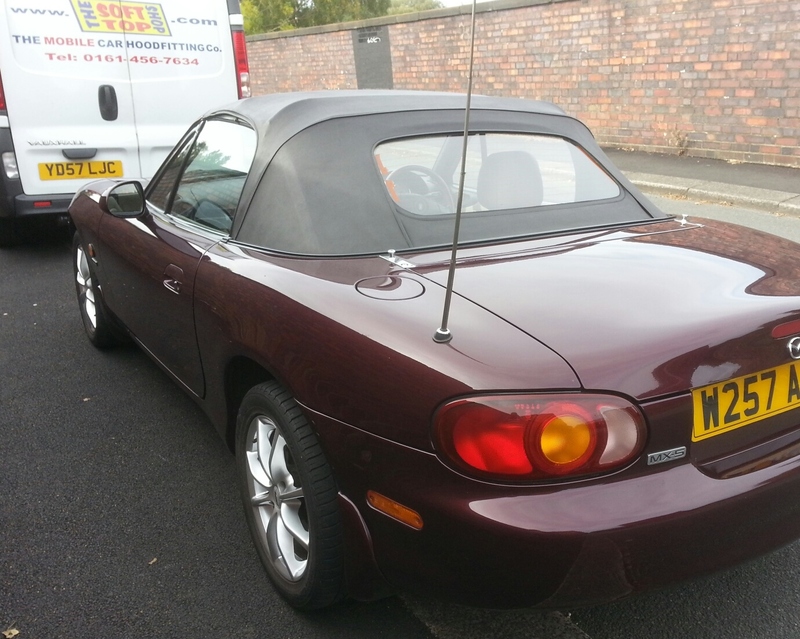 Remove any rust from the frame then clean, lubricate and polish it. (Please note: To do a thorough job the frame must be removed from the car, most companies leave the frame on the car because it is quicker, this is not good practice). Replace the hood tension cables. And if the hood clamps aren't locking we will fix them. Original equipment vinyl hood with non-original zipped plastic rear window. This maybe our lowest priced hood, but it is made to the same exacting standards as all our other hoods. 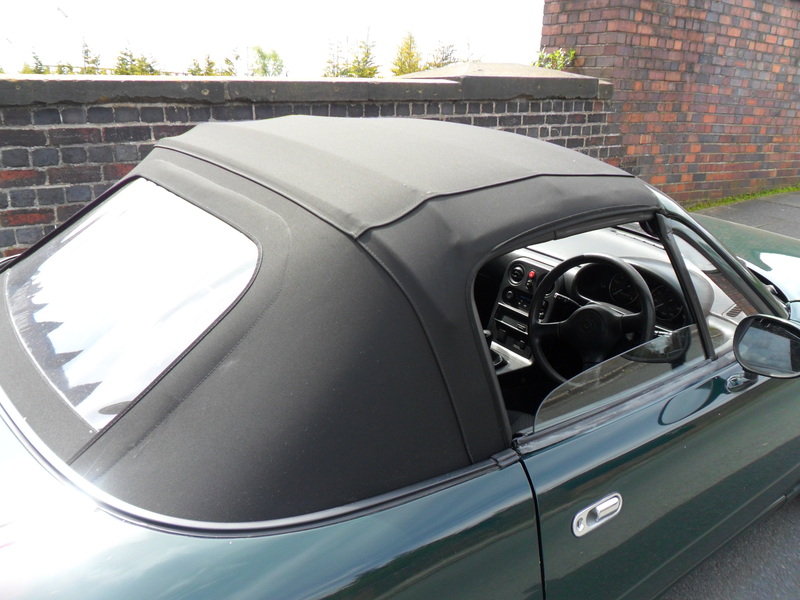 Original specification cabrio vinyl is used, the seams are stitched AND welded for added strength, unlike some of our competitors offerings. It has a zipped plastic rear window and gutters above the doors to channel the rain away so you don't get soaked getting out of the car. We feel this hood is the best quality hood you can get for the money. Original equipment vinyl hood with original style zipped plastic window. This hood is made as close to the original design as possible. 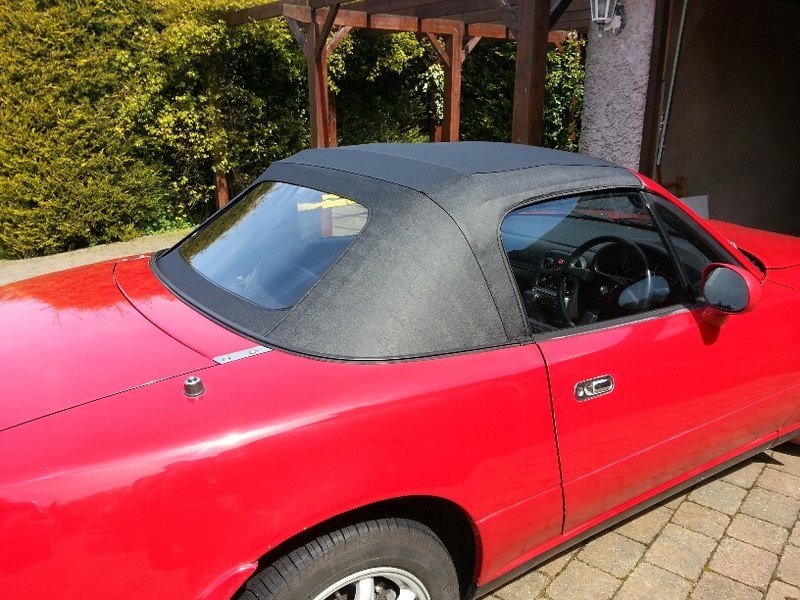 Using only the finest original specification cabrio vinyl, it is manufactured to a very high standard with the original style zipped rear plastic window and double skinned rear section. 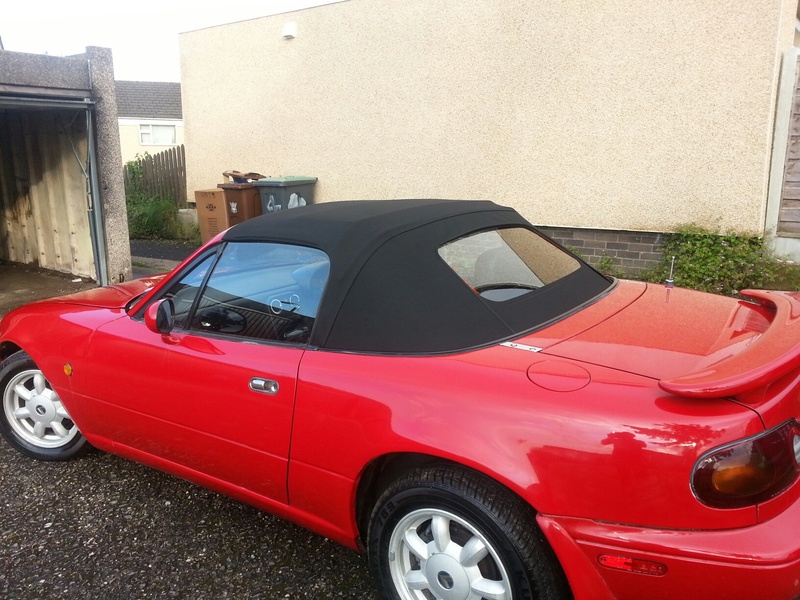 gutters sewn in to the hood above the doors to channel the rain away, so you don't get soaked getting out of the car. 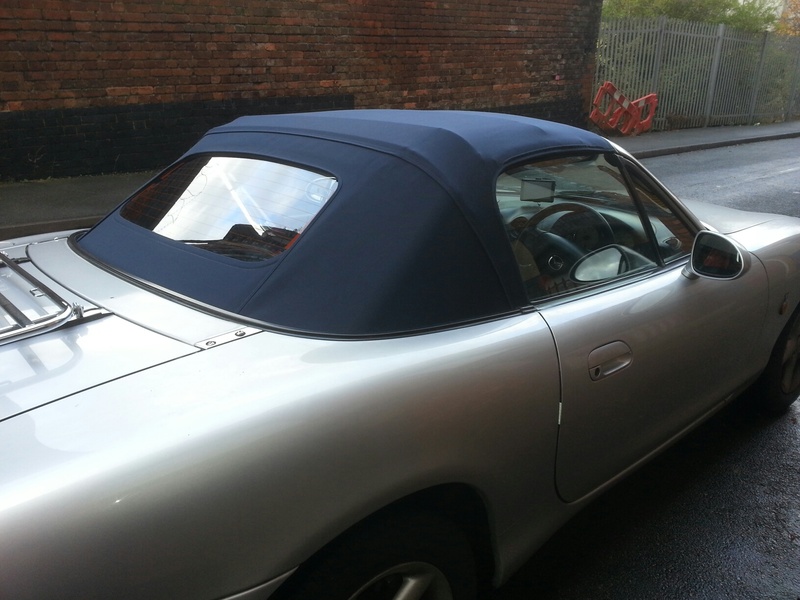 Made from luxury mohair with a zipped plastic rear window. Mohair is used by prestige car makers like Porsche, BMW and Mercedes. 3/4 of the plastic window.There are 2 main types of mohair on the market - stayfast and twilfast. Stayfast is the thinner, cheaper alternative. We only use the finest TWILFAST,which is more hardwearing and won't sag like stayfast can. Shear luxury at an affordable price. If you want the best available, then this is the hood for you. 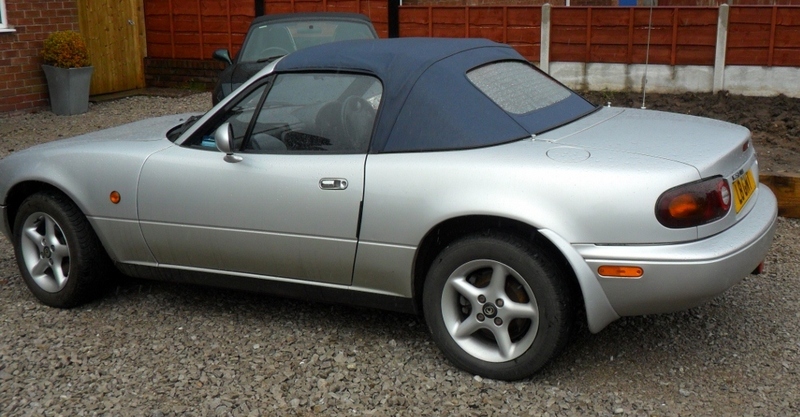 We believe this is the best hood available for the MX5. There are 2 main types of mohair on the market - stayfast and twilfast. more hardwearing and won't sag like stayfast can. material you choose, if you buy it from us you can be sure it is the finest available. 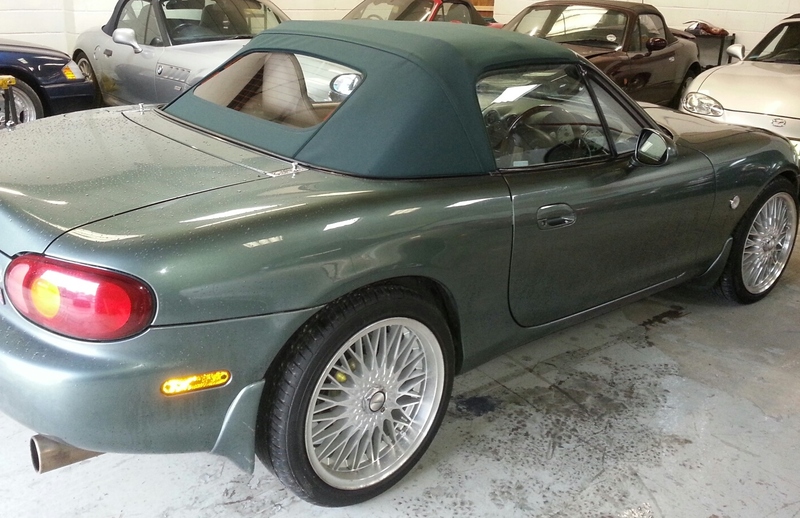 cabriolet vinyl and has a grain that resembles that of cracked leather. It has a life expectancy of 3 to 5 years. WE DO NOT USE THIS MATERIAL IN ANY OF OUR HOODS. This is used by manufacturers like Mazda, Ford, Volkswagen and Toyota. If your modern convertible had a vinyl top originally, it would probably have been made of this. A high quality material with a life expectancy of 7 to 10 years and has a doppled effect grain. ALL OUR VINYL HOODS ARE MADE FROM THIS MATERIAL. as mohair. When comparing prices make sure you are comparing like for like. It is a hardwearing material but is not as good as twilfast. To tell the two apart, stayfast has the same pattern, front and back. Twilfast has a herringbone design on the reverse side. This is a superior quality canvas type material, as used by luxury car manufacturers like BMW, Mercedes and Porsche.This is the finest material there is. This material can last 15+ years. Available in black, blue, red, green and tan. ALL OUR MX5 MOHAIR HOODS ARE MADE FROM THIS MATERIAL.